Jay Wilson of Blizzard says that despite what you may have heard from a certain community manager, Diablo 3 is in great shape and fans should keep their expectations high. Back in mid-February, Diablo 3 Community Manager Micah "Bashiok" Whiple posted a message on the Battle.net forums suggesting that Diablo fans tone down their hopes for Diablo 3. Part of his job is managing people's expectations, he explained, and he's started to worry that the game just won't be able to meet them. "Stop thinking about how awesome this game could be. Just imagine it's a new M. Night Shyamalan movie," he wrote. "Sure Sixth Sense was amazing and Unbreakable had its moments, but this right here is the sequel to The Village... or The Happening... or Signs... or any of the movies besides the two I first mentioned. So just like, lower those expectations, but still definitely buy the game please, and everything will be just fine." His comments were pretty obviously a joke, but that didn't stop some people from taking them seriously - seriously enough that Diablo 3 Director Jay Wilson felt it necessary to release a message of his own reassuring gamers that it will in fact be awesome when it comes out. 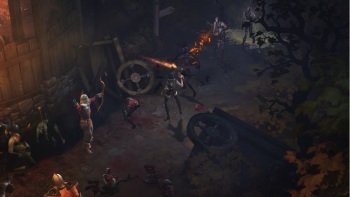 "Some of you might have seen some headlines or a certain (obviously sarcastic) blue post that implies that we're unsteady about where Diablo 3 stands, and that you should temper your expectations when it comes to the next installment in the Diablo series," he wrote. "Let me be clear: Nothing could be further from the truth." "As those of you in the beta have seen, the game is in good shape. Actually, I should say that the beta version of the game is in good shape. The latest full build we've been testing here in the office is in great shape," he continued. "We want you to have high expectations for Diablo 3 and all Blizzard games. That's what pushes us to try to make the best gaming experiences we possibly can. If Diablo 3 wasn't a worthy next installment in the Diablo series, we wouldn't release it." Wilson also said an announcement of the Diablo 3 release date would be coming "in the near future," but not necessarily "soon." So, people are taking an obvious joke too seriously and Blizzard is being simultaneously promising and evasive about the release date of its Next Big Game? Sounds like just another day on the internet to me.